I love when an activity can be used exactly the same from when a child is a toddler all the way through to my year 3 (3rd grade) without any additional thinking or activities. 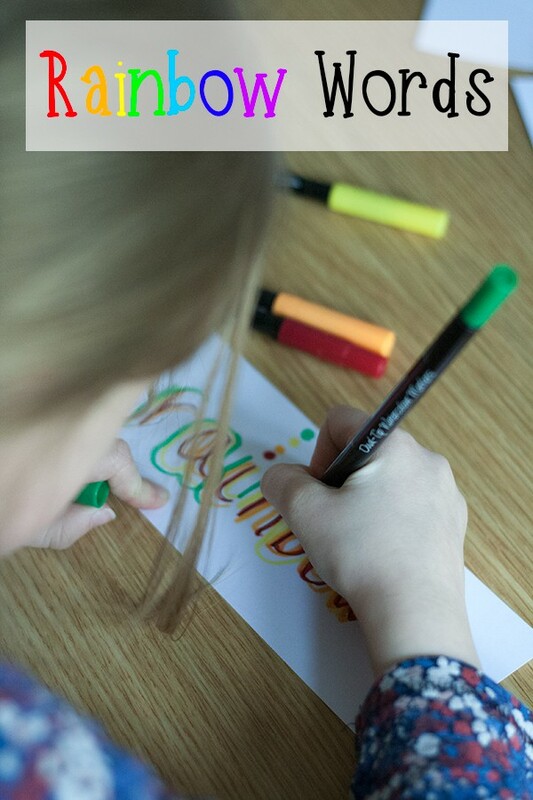 This Rainbow Word activity is something that I have used with both of my kids since they could hold a crayon and were making marks on paper. 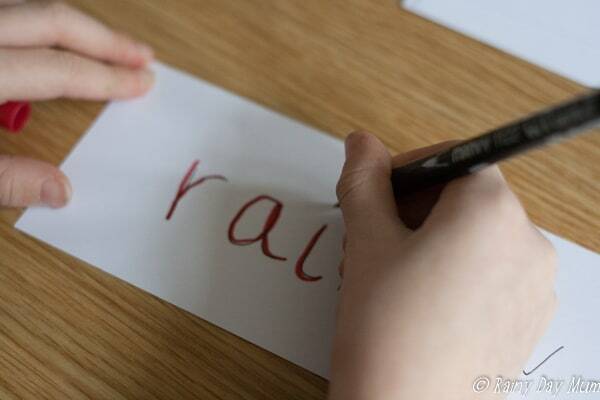 From learning the letter sounds to your weekly spelling lists there are so many applications for this that I can’t believe I have never included it before on Rainy Day Mum. This week’s theme for the Virtual Book Club for kids is Rainbows with the featured book A Rainbow of my Own by Don Freeman but don’t worry if you can’t find this book scroll down and later on I have 4 other books that you could use for a Rainbow themed book choice or add to your book box this week. 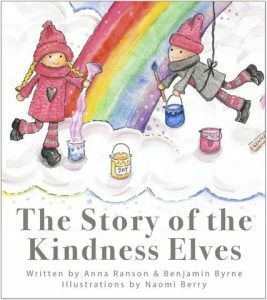 And don’t forget to check out the Rainbow themed activities at the end of the post from the co-hosts of the weekly virtual book club for kids. 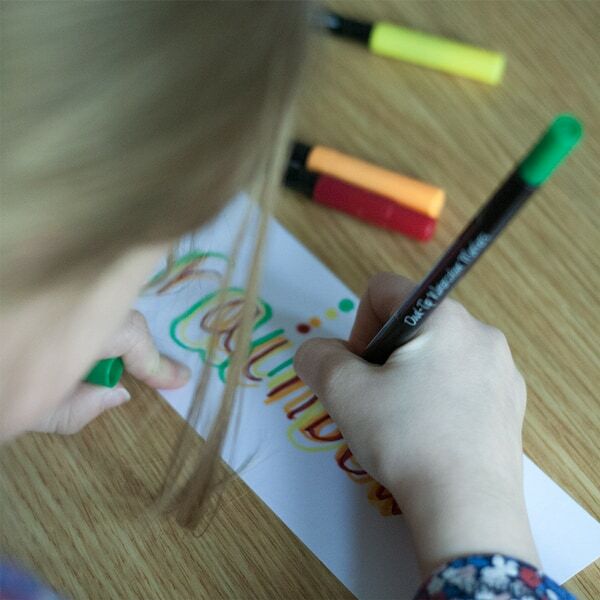 This is such a simple activity and like I said I use it over and over again with my kids so today I roped in my 6 year old to give me a hand with the pictures and help her with her weekly spellings but don’t worry it’s not aimed at that age group as it was something that we started with when she was a toddler. First with all activities cut up your paper in strips – this means that it is easier to get started you can quickly set up one line, shape, letter, name or word and then work on others. I try and do no more than 5 at a time. 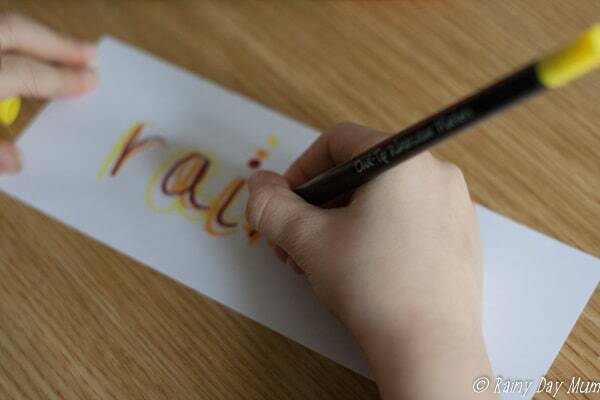 Using a ball point pen draw or write your symbol and hand over the card to your child. Then let them trace it with first red, then orange, yellow, green, blue, indigo and violet. It will be a little messy looking but the repetition of following the same pattern is good for muscle memory. 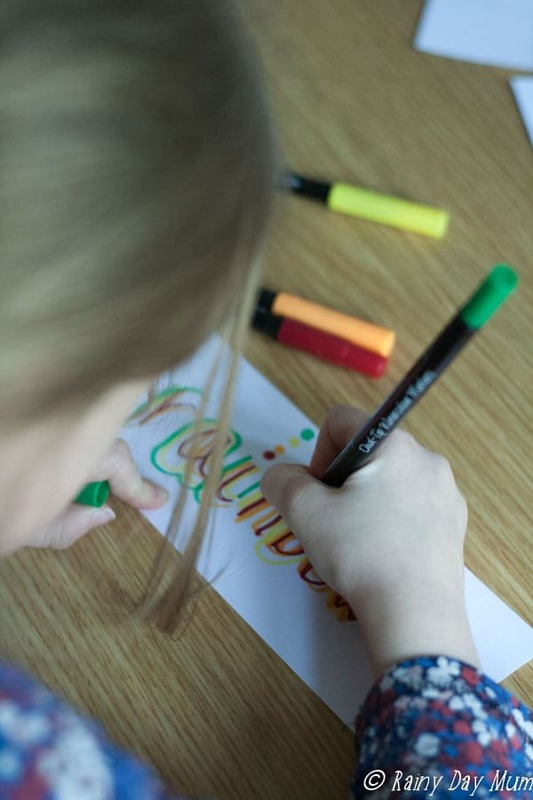 With this age group we worked on two different versions of the activity the first a pre-writing version of rainbow words working on tracing lines and shapes and the second learning our names with rainbow words. In the first activity draw common line forms like straight lines, circles, v, w, l, n shapes. Dots are good as well as you will find that eventually they will draw around the dot to form a circle. With learning their name write the name – DON’T skip the capital and it’s best if you use a mix of times when you write their name in all caps and other where you use UPPER and lowercase as you would expect them to write their names eventually. In preschool when the child is ready transition from just their names on to letters leading into diagraphs and trigraphs and eventually the very first words and your first few sight words. Start with the letters and maybe coordinate them with letter of the week or the letters sounds and phonics you are working with them on or you know they are working on in their preschool setting. Form the letters as you would expect them to write them and before you hand over the red trace the way they are to write the letters and trace them with your finger, then their finger and then they trace with their finger independently. Good formation of letters can start early so try and follow this pattern as it’s easier to learn to form them correctly from the start than try and correct the formation later on. 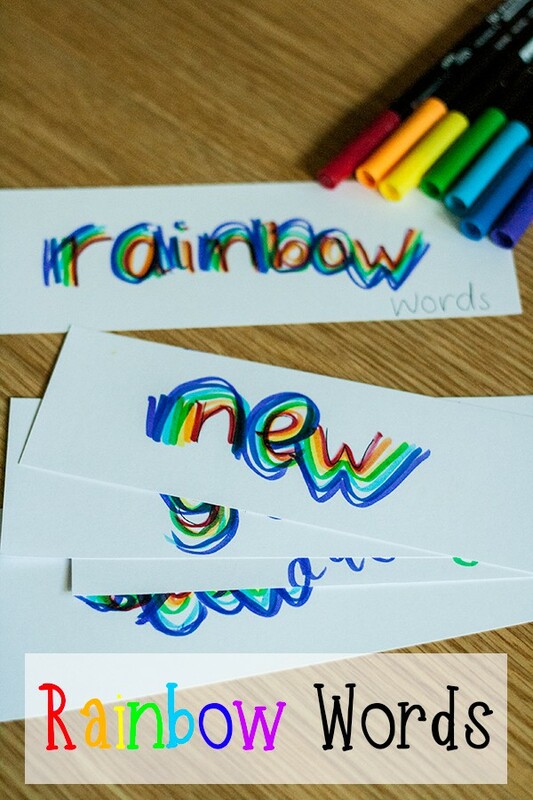 Rainbow words can be used right through to when you are helping your child learn to spell, our weekly sight words and spellings one of my arsenal of ideas for helping my struggling speller to get to grisps with the words each week is using rainbow words. Do you have a book box where you store your book for the week – we still use the DIY box I made back when my eldest was a toddler but it doesn’t have to be as fancy as that instead a simple crate or wicker basket that your children can easily reach is perfect. If you are following with our weekly Virtual Book Club for Kids and have joined our Facebook Group then either the week before or very early in the week we will share with you a fuller list of themed books for that week that you can see if you can find. However, for us, I’ve always just used 5 books on a theme – although with common themes like Frogs and our Seasons I tend to add more and switch them out as we go through the weeks. This week our featured book is A Rainbow of My Own by Don Freeman – a story about a young boy trying to find a rainbow of his own to play with because what child doesn’t want to find that rainbow. Check out these activities for the Rainbow week from the cohosts of the Virtual Book club for kids to add to your week of learning at home or in your setting.